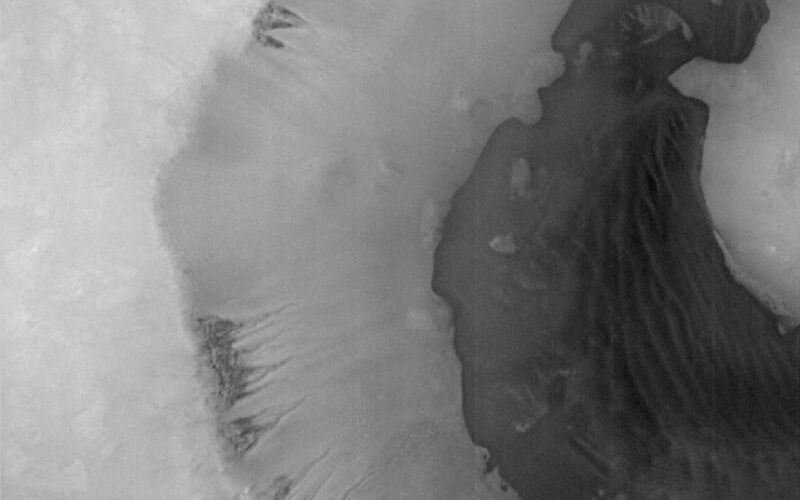 Mars Orbiter Camera (MOC) image 7707 (subframe) reproduced at full resolution, about 24.5 meters/pixel (80.4 feet/pixel). Picture shows an area approximately 25.1 x 31.3 km (15.6 x 19.5 miles) in size. Sun illumination is from the lower left. The MOC image is centered near 65.1°S latitude, 15.1°W longitude. Image was obtained during the Southern Spring season on December 29, 1997, at 1:19 p.m. PST on Mars Global Surveyor's 77th orbit around Mars. Despite evidence of catastrophic floods and integrated valley networks on Mars, unequivocal evidence of ponding has been difficult, if not impossible, to find. MOC image 7707 shows what, at first examination, appears to be such evidence. 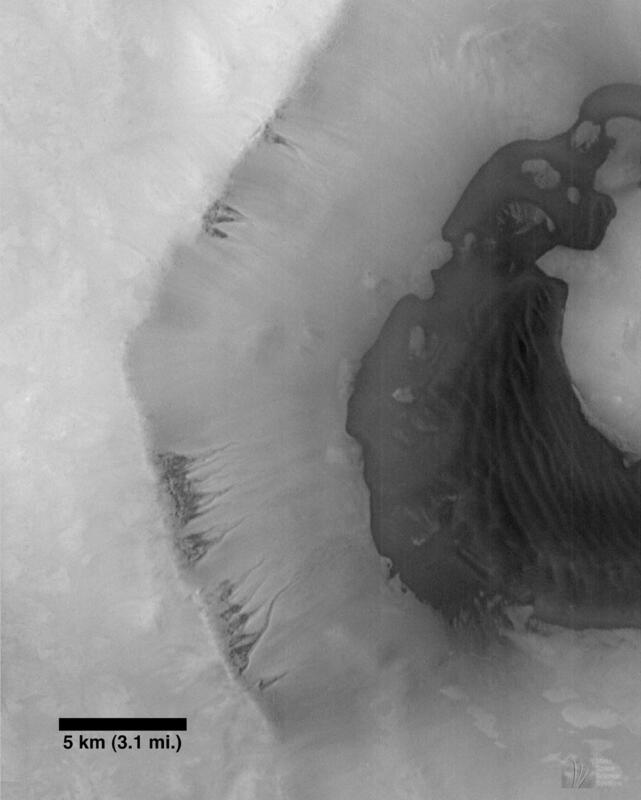 There are two striking geomorphic attributes of the crater shown in the image: (1) The crater wall shows channeling suggestive of fluid seepage; and (2) The contact (i.e., the boundary between two types of geologic materials) between the dark floor materials and the lighter materials of the crater wall suggests, by the formation of bays and peninsulas, a ponding relationship. 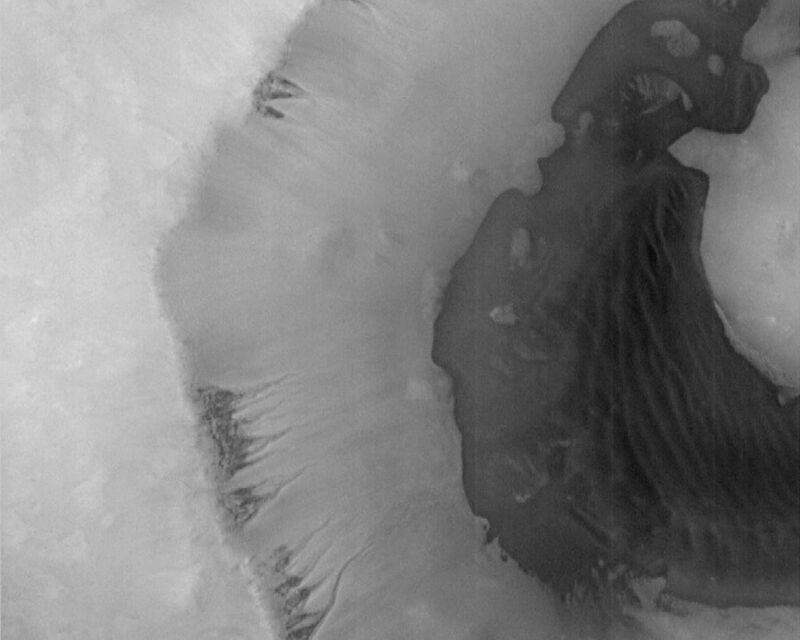 These relationships are best and most easily explained if, at some time in the past, water seeped out of layers within the crater wall and flowed down into the crater, flooding part of the crater floor. In this interpretation, the dark material may be sediment transported by the seeping water. The appearance of dunes within the crater may be coincidental, or the sand may have been generated by wind and wave action. The lack of superimposed fresh impact craters suggests this process may have been active relatively recently. It is important to note that both the channel and floor relationships seen in this image may be formed by other processes, and that there is also the possibility that they may not be related (i.e., that the fluid from the channels did not emplace the dark, ponded floor material). It is also important to remember that a fluid other than water, for example, fluid lava, could be responsible for the features seen. Indeed, lower resolution Viking and some MOC images suggest just such an alternative explanation. The absence of craters may reflect the difficulty of the materials to preserve such features, or their burial by dust. 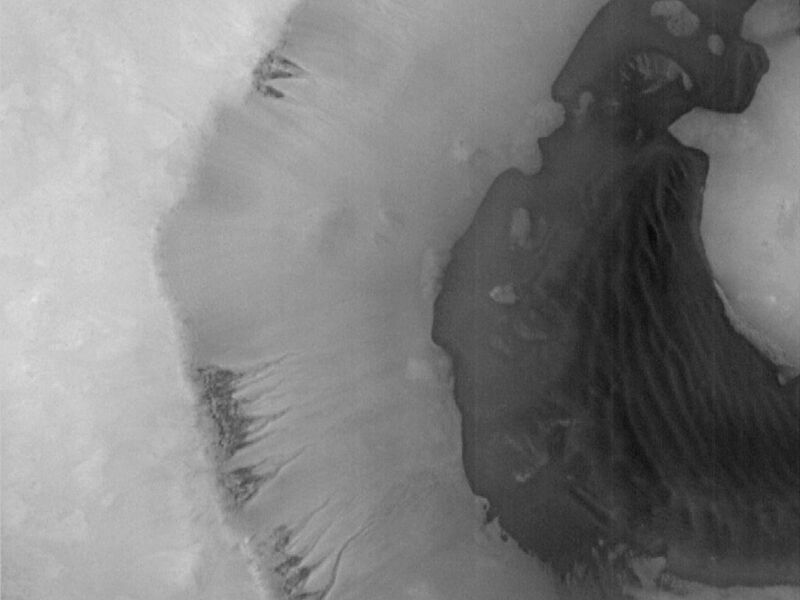 Finally, the environmental difficulties of having liquid water seeping from the wall of a south polar crater are quite formidable. For these reasons, caution must be exercised in adopting any specific hypothesis.